Strong cat urine odor and other smells are common after encapsulated crawlspace work is done. The good news is expert Michael Masserang of Masserang Consulting has an effective, affordable and permanent solution. 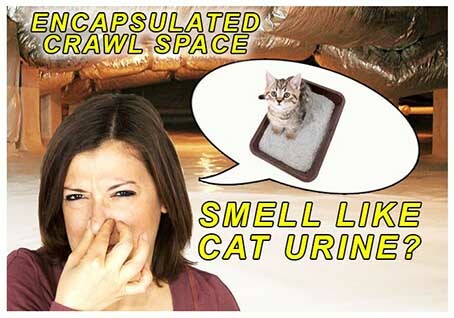 There’s no shortage of reasons while an encapsulated crawlspace could be giving off bad smells, especially the very common problem of crawl space cat urine odor. The frustration comes from trying to remove the smell, which is generally much easier said than done. Answering the call is Specialty Foundation Repair Crawlspace Consultant Michael Masserang. After investigating many different options Masserang has a solution that resolves the problem, the Atmox System. With the odor issue effecting up to 10% of all crawlspace encapsulations, this is a welcome development for many homeowners facing the issue. According to the expert crawlspace consultant, the odors can originate from many different sources. First, when encapsulation crawlspace work is done, it often traps in any existing smells. Beyond that other material involved in the work, like plastics and HVAC materials can give off unpleasant smells. Bio film, fungi and mold also release odors that are more than repulsive and impact homeowner quality of life in serious ways. The Atmox System controls ventilation which can both manage moisture inside a crawlspace and also remove odors and smells of all kinds. Rather than a thermostat the system uses dew point comparison sensors for a more accurate and reliable way to measure exactly what’s going on inside a crawlspace reliably. An engineered fan system ensures the entire crawlspace is kept ventilated, a vital part of keeping a crawlspace hygienic and not giving off terrible smells. The entire unit runs on one electrical outlet for control, sensors and power supply, and is quite easy for a homeowner to manage. Michael Masserang and his team at Specialty Foundation Repair are experts in installing the Atmox System in a way that maximizes its benefit, earning the company consistent and enthusiastic praise, for removing any existing odor issues and keeping them away permanently. Masserang personally has done hundreds of crawlspace inspections in both residential and commercial properties and is widely recognized as the local Charlotte area’s crawl space expert. Recent reviews continue to completely endorse Masserang and Specialty Foundation Repairs work with the Atmox System and eliminating the cat urine smell issue in particular. For more information or to book an appointment be sure to visit https://masserangconsulting.com. – (704) 787-6972.